“If I had a small amount of outdoor space and had to pick between a grill and a smoker, I’d choose a smoker. When you’re grilling, you get the char because it’s quick and you’re right above the flame, but a smoker uses wood chips to infuse a lot more smokey flavor into the meat, while still leaving a charlike crust. To me, that’s what barbecue is about: the smoke. That’s what makes the difference. Smoking things might take more time — say a steak that takes 8 minutes on a grill might take 15 minutes on a smoker — but you turn out a better product. Always. “I’d get the Masterbuilt. 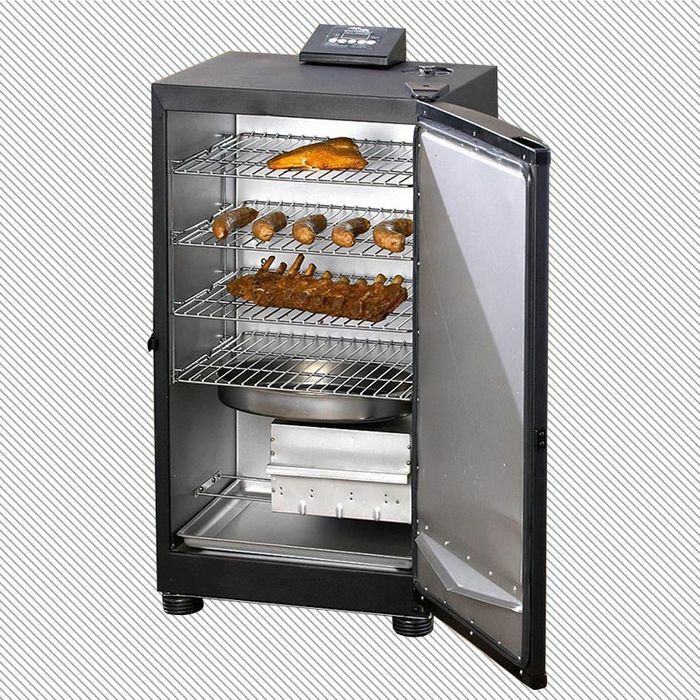 It’s a digital smoker, so you can actually punch in the temperature you want and it takes you right there from 100 degrees to 275 degrees in just a few minutes. At this small size, most other smokers don’t have that capability. It also has a box on the side for your little wood chips to feed the coal and give it that extra bit of smoke, which is essential. It’s got 730 square inches of cooking space with four chrome racks, so it’s got a lot of space and it’s easy to clean. I actually build smokers for a living, but those are way too big for a city space. This one is just as good as anything bigger, but it only weighs around 45 pounds, so it’s really light and very easy to maneuver up to an apartment. Plus, it’s affordable. *This post has been updated to reflect that Myron Mixon is from Georgia, not Tennessee. The Strategist is a series of smart, obsessive shopping guides from the New York Magazine section of the same name. We’ve scoured the web to bring you the best of the best. Some of our latest conquests include rolling luggage, umbrellas, beach tents, incense, white T-shirts, nail clippers, and yoga mats. If you buy something through our links, we may earn an affiliate commission. Please note that all prices are subject to change.